“Why are they all ugly little men?” asked Cindy, after I’d dragged her to three solid weeks of Charlie Chaplin, Buster Keaton, Harry Langdon, and Harold Lloyd at a silent film comedy festival, back in those dim, dim days before the invention of home video. Well, if you hang around women long enough, sooner or later you’re going to get more truth than you can handle.1 But why were they all ugly little men? And what was their secret? Today, we watch films like Birth of a Nation, The Cabinet of Dr. Caligari, The Mark of Zorro, The Sheik, and Metropolis because they’re a part of film history. We watch The Gold Rush and The General because they’re funny. If the human race is still around five hundred years from now, which is looking less and less like a sure thing these days, it wouldn’t surprise me if their image of “Twentieth-Century Cinema” consisted of a single figure, Charlie Chaplin. Although he grew up in severe poverty, he moved easily in international society, making home movies with members of the British royal family. Presley, in contrast, was never able to regard his gigantic success as anything more than a fluke and clung to a “take the money and run” attitude that turned the latter part of his career into a painful joke. In Mabel’s Married Life (1914),6 one of the few Keystones that is available, we see immediately why Chaplin captured the country’s imagination. Other performers, when they make an entrance, run to the center of the stage,7 look directly at the audience and then roll their eyes and wave their arms in strange, exaggerated, repetitive gestures meant to convey what? Fear? Happiness? Anger? The audience has no idea. Mabel’s Married Life is a frenzied, slapstick farce, built almost entirely around manic flirtation and aggression.9 If one took this film seriously, one would assume that in 1914 America married couples did nothing except pursue extramarital affairs. Chaplin started at Keystone making $150 a week. He switched to Essanay12 in 1915, getting a raise to $1,250 a week (A year later, at Mutual, he would be making $12,000 a week).13 Essanay gave Chaplin much of the control he wanted over his films, although he furious that they insisted on billing him as “Charlie Chaplin.” “Charlie,” he felt, was undignified.14 The Charlie of these films is virtually a walking id, furiously aggressive, flirting with every woman in sight and knocking down every man he meets,15 and it was this Charlie that first made him famous. All over the world, people saw this delicate, fierce, friendless little man as their second self, the person they really were inside. 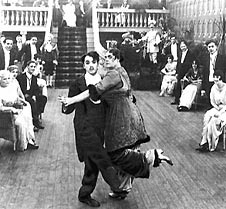 Chaplin took Edna with him when he moved to Mutual Studios in 1916, where he turned out a series of twelve two-reelers known to history as “the Chaplin Mutuals.” These films, including The Rink, The Cure, One A.M., and above all, Easy Street, are among the funniest and most famous short films ever made. However, it is The Vagabond that gives us the fullest taste of the “tragic Charlie,” the “infinitely sensitive, infinitely suffering thing,” that would bewitch audiences in his great feature-length films, like The Kid (1921), The Gold Rush (1925), City Lights (1931), and Modern Times (1935). Buster Keaton would not have cared for Cindy’s reference to him as “an ugly little man.” Photos of Keaton off the set in his glory days reveal a man who thought of himself not merely as handsome but beautiful. Keaton’s taste ran to expensive sport clothes, favoring in particular tight, vee-neck polo shirts to show off his physique, anticipating the “Gene Kelly” look by two decades. 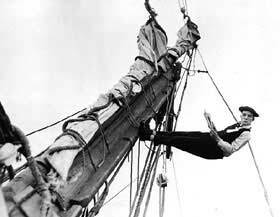 By 1920 Keaton was starring in both two-reelers and feature films.20 Like Chaplin, he was a little man living in a big man’s world. Buster was as friendless as Charlie, but he was neither as fastidious nor as aggressive. Charlie tended to feel that the world owed him a living. Even when he had a job, he did as little as possible. Buster, on the other hand, wanted to fit in. He liked things that worked, and was always looking for the instruction book to life. Amazingly, The General was not a success at the box office, and Keaton’s next two films, College and Steamboat Bill, Jr., also lost money. Keaton lost the artistic control of his films that he had previously enjoyed, and his last two silent features, The Camera Man and Spite Marriage, were made under contract for MGM. Unfortunately for the auteur theory, they’re both extremely funny, particularly Spite Marriage. Both films are set in New York and have a “Roaring Twenties” flavor lacking in Keaton’s other films. Lloyd removed a lot of the aggression that had been standard in early slapstick. He made bright, sunny films that relied on a steady stream of ingenious gags to entertain the audience, rather than endless fisticuffs. Lloyd was a gifted physical comedian, but what really made his films work was his ingenuous optimism that never flagged, despite the endless setbacks and cascading frustrations that a malign fate had conceived for him. Everything will work out, by golly, if a fellow will just apply himself and keep a good attitude. And of course everything did. Lloyd was as much a striver off-screen as on. He made dozens of unfunny films ripping off Charlie Chaplin (the insufferable “Lonesome Luke” series that began in 1915) before developing his own persona. He was very proud of making more money than Chaplin, which he did in large part by making so many more films than Chaplin did.25 Lloyd was, in fact, one of the richest men in Hollywood during the twenties, and his huge estate was used for shots requiring a backdrop suggesting limitless wealth. According to contemporaries, Harry Langdon slowed comedy down. Langdon didn’t enter films until 1923, when he was almost forty. He’d been a headliner in vaudeville for almost twenty years, doing a single act, “Harry’s New Car.” Langdon’s baby-faced on-screen persona was the most passive of the silent comics. Chaplin struggled first to dominate the world and then, in his later comedies, to find a soul as noble and as innocent as his own; Keaton sought to impose rational order on a world that seemed to lack it; Harold Lloyd wanted acceptance and success; Harry Langdon simply wanted to survive. Frank Capra is credited by many with figuring out what to do with Langdon, which generally meant putting his near-pathetic innocence up against a bad girl, or at least an insanely glamorous one. Capra directed Langdon in the three features available on DVD, films that made Langdon a major star. Unfortunately for Harry, he decided he didn’t need Capra to tell him what to do and took up directing himself, quickly running his career into the ground. Seen today, Langdon’s best shorts hold up better than his best features.26 His personality was so passive and unchanging that he needed a tight script to get consistent laughs. Still, Langdon’s best work, like A Saturday Afternoon, is very good. Why Were They All Ugly Little Men? The world of silent film comedy was an inverted world, a world in which everyone acted out as furiously as we in the real world repress. It was a world in which the little man defeated the big, the ugly defeated the handsome, and the poor defeated the rich. And who among us does not feel that the world treats him as little, ugly, and poor, and who does not dream of turning the tables? The silent clowns were urged on by just these demons, and used their careers to make their fantasies come true. All four of the silent clowns were innocent, but the quality of their innocence varied. The early Chaplin had the innocence of a two-year old, an unchained id that amuses solely because it lacks the physical strength to enforce its will. 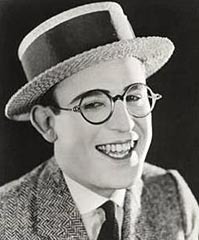 In his later films he transformed himself into a holy fool, although satyr’s horns still lurked beneath his derby’s crown.27 Keaton had more than a hint of the idiot savant in his make-up, while Langdon was so obviously a case of arrested development that he gives people the creeps even today.28 Harold Lloyd was the only one of the four who was capable of growing up, though when he did so he of course lost all his charm. Why did slapstick die with silent film? 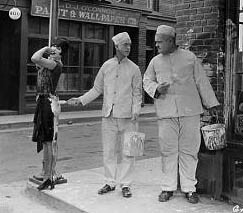 The talkies hurt slapstick by making films more real. Mack Sennett started the tradition of “undercranking” comedies to speed up the action.29 In an undercranked world, objects seem to lack mass, and violence loses its brutality. A punch in the nose is an insult, not an injury. Sound films had to be shot and projected in real time, making the frenetic chases, fights, and pratfalls that made up so much of silent film comedy seem earthbound, painful, and unfunny. Both Chaplin and Keaton also relied on the silents’ “quick time” to make their physical dexterity seem almost superhuman. Thought and action, separate for the rest of us, were one with them. The real time of the talkies made them prisoners of gravity, just like everyone else. In addition, talkies were new, and public wanted to see new comedies in a new medium. Whatever the movies hadn’t been able to do before was at a premium. 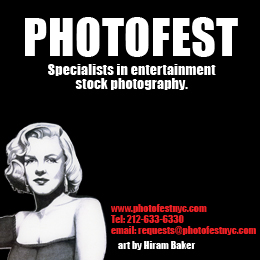 Silent films were old hat, and the great stars of the twenties were old news. Chaplin, with his unique popularity, was able to stretch his transition from silents to talkies over a decade and completed one successful talking film, The Great Dictator. His remaining talkies were sabotaged more by his gigantic ego than any problems with the new medium. 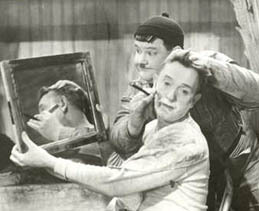 The true slapstick survivors, of course, were Stan Laurel and Oliver Hardy. Stan and Ollie were just getting their act together as a team in 1927, when the release of The Jazz Singer signaled the end of the silent era. They’d learned from Harry Langdon that the anticipation of a gag and the reaction to it were as funny as the gag itself, and, besides, you got three laughs for the price of one.31 They were already working slowly when sound came in. Because they weren’t stars, and didn’t have an established act, they were willing to learn how to work with sound and make it a part of their routines.32 And they were very, very funny men. All of the films that Chaplin made for Essanay are available on three DVDs from Image Entertainment. 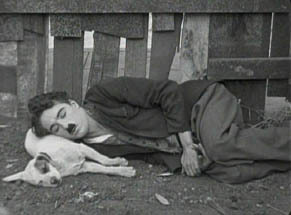 Volume 2 contains His Regeneration, in which Chaplin only has a cameo, and Volume 3 contains Police and Triple Trouble, which the studio pieced together from footage that Chaplin shot for “Life,” a never-finished feature. Image also offers three DVDs that cover all of Chaplin’s work for Mutual studios, two that cover all of his work for First National (including The Kid), and a single DVD that contains Mabel’s Married Life and Tillie’s Punctured Romance. All are well-restored, with lots of extra materials. Image has also released all of Chaplin’s feature films individually. “Budget” Chaplin compilations are usually not worth the money. 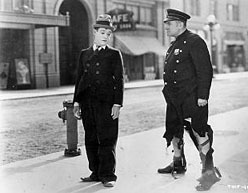 Kino International has released all 10 features Buster Keaton did before going to MGM, along with a total of 19 shorts. There are 10 discs available individually, plus a complete set with a bonus disc of home movies, television appearances, etc. Keaton’s last two silent features, The Camera Man and Spite Marriage, are only available on VHS. The two-reelers that Keaton did with Fatty Arbuckle are available on two DVDs from Kino. Three Harry Langdon features, The Strong Man, Tramp, Tramp, Tramp, and Long Pants, are available on a single DVD from Kino. 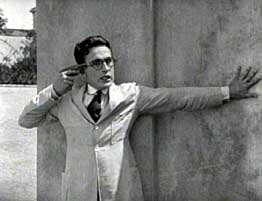 Restored versions of Harold Lloyd’s feature films are now appearing on the TCM cable channel. Presumably, they will be released on DVD sometime in the near future. Image has released The Slapstick Encyclopedia on DVD, five discs containing 53 shorts, over 18 hours of film, too much, probably, for most viewers. 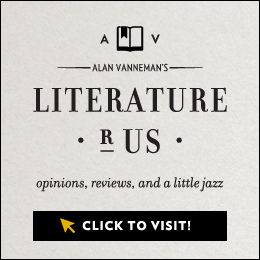 While there is much here to delight the aficionado, there are more than a few clunkers as well, and many of the best films are available in other collections. However, there are a number of true gems, including some shorts by Chaplin, Lloyd, and Langdon that are not available elsewhere on DVD. In addition, there is some very rare footage of Max Linder, Chaplin’s one great inspiration. Linder’s facial expressions and fastidious gestures are quite suggestive of Chaplin. If you’re fortunate enough to have a library that’s carrying DVDs, you might ask them to pick this one up. Laurel and Hardy’s silent films are available on a nine-volume series, called The Lost Films of Laurel and Hardy, although these films have never been lost. The discs are padded out with numerous shorts that feature either Stan or Ollie or neither.